Travel to Cloverdale by way of Alabama Hwy. #157 & proceed about 4 miles north. Turn right onto County Rd. 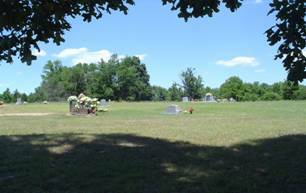 #10 and travel approximately 2.3 miles to the cemetery on the left by the church and behind the church. Portions of the cemetery grounds were acquired from Tom Hayes and wife. 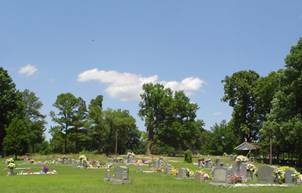 Later cemetery acquisitions were from Willie & Hattie Mae Hayes and descendents. The church was built about 1940, with the cemetery starting about the same time. Decoration day at Antioch is the second Sunday in June. Baskins, Vivoal Lee (Vickery); b. 28 Jan 1938, d. 10 Oct 2012, wife of Howard Lee Sr.
Bates, Peggy; b. 04 Jun 1946, only date, wife of George Washington Jr.
Bates, Randy Wayne; b. 09 Sep 1958, d. 31 Jan 1959, son of Mr. & Mrs. George Washington Bates Sr. Dial, Mary L.; b. 25 Sep 1907, d. 15 Sep 1990, wife of Walter Y. Gray, Patsy Ann; b. 13 Jan 1955, d. 08 Feb 1995, wife of Robert L.
Hayes, Doris A.; b. 01 Apr 1940, only date, wife of Carmel A.
Hayes, Hattie Mae W.; b. 13 Apr 1908, d. 21 May 1999, wife of Willie J.
Hayes, Joyce Marie (Rhodes); b. 29 Oct 1935, d. 05 Jul 1994, wife of Dewey C.
Hayes, Linnie M.; b. 06 Aug 1909, d. 12 Aug 1977, wife of Jesse R.
McGee, Beulah L.; b. 10 Oct 1908, d. 28 Sep 2002, wife of Rollie L.
McGee, Charles Matthew; b. 26 Sep 1969, d. 28 May 2017, son of Carolyn & Dewey Sr.
Morgan, Vera Inez; b. 21 May 1927, d. 23 Jun 2006, wife of Arnold C.
Reidout, Clara P.; b. 29 Sep 1906, d. 05 May 1982, wife of Roy E.
Reidout, Rosa Ann; b. 14 Apr 1936, d. 13 Dec 1994, wife of James R.
Whitten, Annie Ruth; b. 05 Feb 1931, only date, m: 19 Oct 1947, wife of Julius J.
Willis, Mary H. ; b. 20 Feb 1914, d. 29 mar 2004, wife of Emmett H.